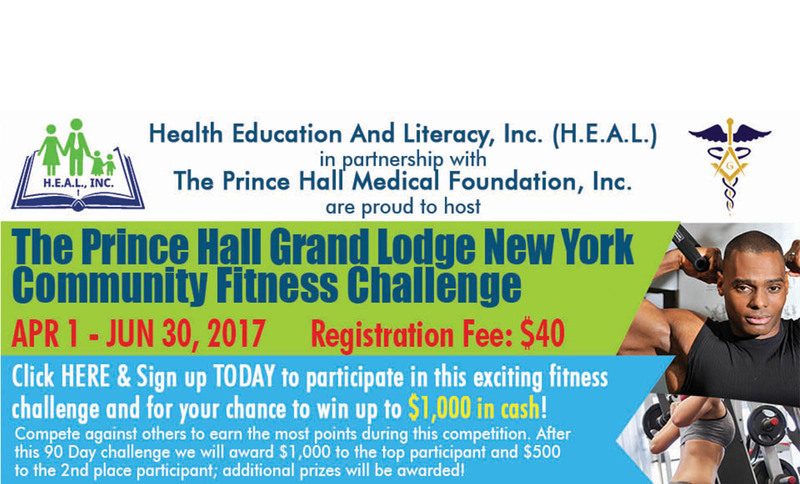 Food, Fitness & Fun Fair | The Prince Hall Medical Foundation, Inc. The Most Worshipful Prince Hall Grand Lodge of the State of New York under the leadership and direction of Grand Master Larry Mitchell. Fresh Direct Supermarkets – Larry Blackmon Jr. Through countless awareness campaigns, Prince Hall Medical Foundation President, Edward D. Swire, and Executive Director, John J. Phillips, worked tirelessly throughout the year to perpetuate the legacy set forth by the Most Worshipful Gregory R. Smith, Sr., Past Grand Master of Prince Hall Masons of New York State. Past Grand Master Smith recognized the need for addressing the quality of health of the Masonic Membership and to provide mechanisms to address them. His vision was to galvanize the members of the organization, caregivers, and donor organizations to respond to the medical needs in communities across the state through advocacy, health fairs, and partnering to secure health services. Through the creation, development and implementation of various outreach programs, the Prince Hall Medical Foundation is dedicated to its vision of healthful empowerment. It is a vision of partnering with organizations, services and health professionals who are committed to assist in establishing local resources, addressing the medical needs of the underserved. Since its inception, these partnerships have produced annual health fairs, seminars, and blood donation drives that benefit the community. The Food Fitness & Fun Fair event is the product of one such partnership. As a collaborative effort, the PHMF and Health Awareness & You proved to be a huge success. HA&Y is an initiative of the newly incorporated not-for-profit entity, Health Education And Literacy (H.E.A.L. ), Inc. H.E.A.L., Inc. will continue to help individuals and communities live better lives through health education and provide a stronger awareness of the impact that health literacy has on the lives of people. H.E.A.L., Inc. will also continue to bring relevant, simplistic information to individuals so that they can make better choices and well-informed decisions about the food they eat, the importance of exercise, and how it plays a crucial, life-saving role in their everyday existence. Founded by Delsheda Khanii in 2013, HA&Y was established to raise awareness about the exponential increase and negative impact that diseases such as obesity, diabetes, hypertension, and high cholesterol have on our community. With the assistance of Lisa Gibson, Vice President, HA&Y has established and implemented several life-transformative activities that bring awareness to common health concerns of the community—life-transformative activities that take action to bring about healthy lifestyle change. President Swire has proudly committed to continue the partnership with Ms. Khanii in promoting the Health Awareness & You initiative by announcing that The Food, Fitness & Fun Fair will take place again on November 7, 2015 at the Grand East. Through this partnership, both entities are excited about hosting the event, ensuring that valuable information and services will be offered to participants. This salubrious knowledge will help them live more wholesome lifestyles, channeled through better nutritional choices and a higher awareness of health and wellness resources available to them. The Prince Hall Medical Foundation, Inc.
© 2014 The Prince Hall Medical Foundation, Inc.